We know how important it is to keep your Toyota in proper working condition. Regular maintenance and oil changes provide protection for yourself, your loved ones and your investment. This is why our certified technicians use only genuine Toyota parts and fluids when we perform any type of maintenance. For oil changes, we use Genuine Toyota Motor Oil and Genuine Toyota Oil Filters that are specially formulated to keep your Toyota running at peak performance. 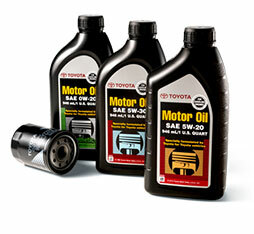 If your Toyota is due for an oil change, schedule an appointment with our Toyota Service Center at Newbold Toyota today! What Makes Synthetic Oil Different? From a quick glance, synthetic oil changes are simply more expensive, but what makes the difference? Synthetic oil changes can typically run $20 to $30 more than a conventional oil change, but in the long run, they can actually save you money! Synthetic oil can help improve your Toyota's fuel economy by half a mile per gallon of gasoline, which adds up over time. A vehicle that normally achieves a base 20 MPG can save you up to $36 after 10,000 miles, assuming gas costs are $3.00 per gallon. With that extra $36 in your pocket, you could treat your Toyota to a synthetic oil change for no extra cost and enjoy the benefits that it offers! By choosing to equip your Toyota with our low-viscosity 0W-20 oil, you can expect better engine performance, improved fuel economy and reduced engine deposits from your Toyota. Thanks to the uniform lubrication and reduced friction that our specially crafted synthetic oil provides, your engine will be better protected, operate better in extreme conditions and need oil changes less frequently. If you see oil stains on your garage floor or in your driveway, you could have an oil leak. Oil leaks happen because as cars get older, the gaskets and seals begin to break down and the internal engine pressure can push oil through cracks or gaps in these seals. Common areas for oil to leak can include the Valve Cover Gasket(s), Oil Pan Gasket or even the Oil Pan Drain Plug (or "Oil Plug"). If ignored, a small leak could quickly become a large problem and damage the engine due to low oil pressure. If you think you may have an oil leak, bring your car in and let one of our certified technicians diagnose the source and provide you with the best options for repairing your oil leak today! Low oil pressure or low oil level can be a serious problem for your car. Your engine needs to have the right amount of oil in order to stay properly lubricated or you risk permanent engine damage from increased friction. Low oil pressure can be caused by the oil level being too low or by a malfunction with the oil pump or engine itself. If your dashboard Oil Light has come on after starting the car and stays on or if the light comes on while the engine is running (even if it goes off quickly), this could mean that your car needs immediate attention. When your Toyota vehicle is in need of an oil change, look no further than Newbold Toyota. You can trust our highly trained staff to use Genuine Toyota Motor Oil and Genuine Toyota Oil Filters to make sure that your vehicle is properly equipped so it will run as smoothly as possible. Make sure to schedule an appointment with our OFallon, IL, Toyota Service Center where we look forward to serving all of our customers from St. Louis, Edwardsville and Belleville.